When you want to sell goods and services online, you need an E-commerce website so that you can transfer fund electronically. Whether you are selling Business-to-Consumer (B2C) or Business-to-Business (B2B), we can design the right E-commerce site for you. E-commerce has huge importance in the modern day business world. It has helped retailers as well as end-consumers to break the barricade of time and distance to sell, buy and manage the business. E-commerce has allowed users to shop online easily and with more security Below is just a short list of our expertise in the e-commerce field. E-Market Websites - Websites that provide top quality merchandise at unbeatable price points. 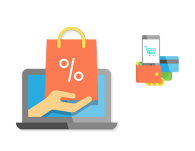 The integrated shopping cart offers several payment gateways for the convenience of their customers. Mortgage Websites - Provide the convenience of online loan applications. Offer fixed variable and a host of other loan types. Integrate functionality for all steps related to mortgage shopping. Still can’t decide? Please visit our portfolio of e-commerce website development and explore the quality of our past work. W3care Technologies is an emerging mobile app and web development company in India. We are in the industry of website development and designing since 2010. We have successfully developed websites for many industries. Ecommerce is one of our favorite categories of website. Our teams are so passionate about learning new things and get over all hurdles to provide best project deployment to clients.